Thank you for accessing Oil Samples via www.zieglercat.com. Oil Sample records have moved to www.my.cat.com. Starting 06/28/2019, you will no longer be able to access Oil Sample records from this page or via the customer.zieglercat.com/ portal. 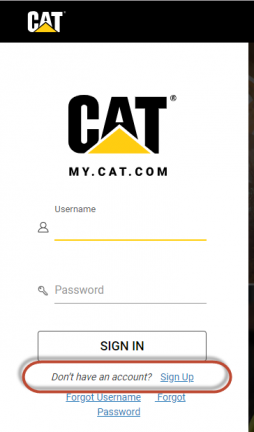 If you have not registered with my.cat.com, please go to the www.my.cat.com welcome page and click on “Sign Up” to request an account. Once you have registered, it will typically take 1-2 business days to finalize your account access for www.my.cat.com. If you have previously registered and have questions, you can send those questions to: FluidLab@zieglercat.com. We will respond to your inquiries within 1 to 2 business days.